Shock and heat proof ABS. 2800rpm class B induction motor. Self lubricating bushes. Thermal cut out. Continuous running. Includes fitting bracket, 2 grilles and 3m ducting. 90m3 extract rate per hour. IP44 rating. 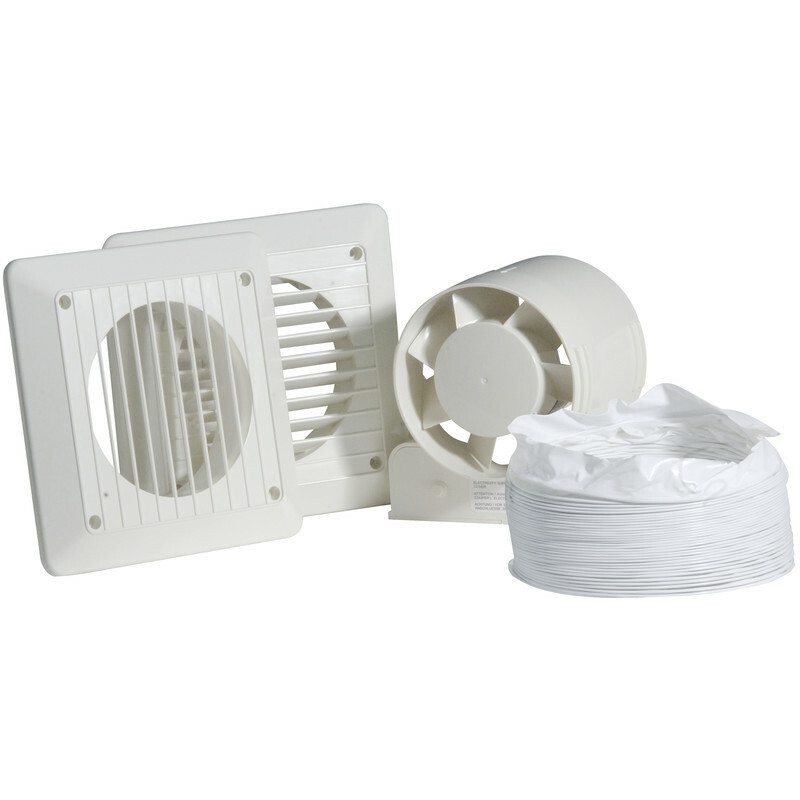 Airvent 100mm In-line Shower Extractor Fan Kit Standard is rated 4.3 out of 5 by 15. Rated 5 out of 5 by Poppy from Fairly quiet unit Bought to replace an existing unit so install was easy. Runs quietly and is efficient. Rated 3 out of 5 by Jonuck from Fantastic not,but works ok The fan works ok,its fairly noisy but does clear the condensation quickly.The instructions arent too bad ,but dont say which outlet is which,show a 3 amp fuse in the circuit youre unlikely to have,and dont say why there are too small clips in the box.The duct is very thin and easily damaged. The main problem with this fan though is there is no back draught shutter, which is essential, and will cost another fiver or so. Rated 5 out of 5 by akc5150 from Super quiet and good extraction rate! Bought to use for an airbrush booth and works brilliantly for this purpose! With a small filer installed over the end and the hose plumbed to the outside, I now how virtually zero odour in my painting area. I know this is not the recommended use for this product, but for spraying non flammable acrylic paints, works fantastically!! Rated 1 out of 5 by Sparky B from Bathroom Fan Had to buy this as one I brought 18months ago failed due to motor winding open circuit. When I took it back it was out of warranty Had no choice if I wanted to keep the customer happy. Rated 5 out of 5 by BB47 from Best Buy This is the quietest extractor I have ever had. Very efficient, easy to fit, with good instructions. A low price as an added bonus!